Much of the debate on the ecological impact of flying has inevitably centred on the aircraft themselves, sometimes leading us to overlook the fact that airports also play their part in the overall balance of aviation and the environment. With around 120 million passengers a year passing through the UK’s three busiest airports alone – Heathrow, Gatwick and Manchester – the facilities needed to service these numbers mean that airports have more in common with small cities than train stations or bus depots. It is hardly surprising that their eco-footprint is a bit larger too! 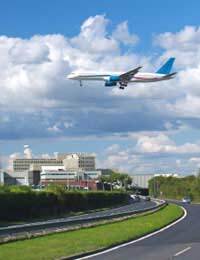 Issues of safety, security and noise have, quite rightly, been long recognised as vital in regulating air travel, but in recent years there has been a growing awareness of the equal importance of environmental quality – both within the industry itself and the public at large. While the potential damage that airports can do is considerable, many of the world’s hubs have made enormous contributions to minimising the harm they actually do cause. The maintenance of airport runways, aprons and other areas is one obvious area where environmental impact can be felt. A variety of potentially harmful chemicals are routinely called for including herbicides, various pesticides and de-icers in addition to the emissions produced by the fleet of support vehicles and the demand for on-site electricity. Flight related factors, such as aircraft taxiing, de-icing, washing and maintenance also generate additional waste, wastewater and local air pollution, which contribute to the overall eco-debit. In addition, the greatest emissions from the aeroplanes themselves occur during take-off and landing – which, of course, tends to further localise the potential environmental damage in and around airports. Passengers transiting thought the terminals bring their own problems. The shops, restaurants, toilets and waiting areas require heating, lighting, water, wastewater and waste services and the numbers of air travellers mean that these facilities are needed on a significant scale. Add to this the electrical cost involved in baggage handling conveyors, motorised walkways and the like and holidays or business travel can begin to look distinctly resource-hungry! Thankfully, it is not all bad news – many airports have taken a variety of positive steps to overcome many of the potential pitfalls, ranging from monitoring air emissions to establishing on-site recycling facilities. It is not all “green-washing” in an attempt to improve the image; monitoring nitrogen oxides (NOx), sulphur dioxide (SO2) and so on enables the local air pollution to be more effectively modelled and controlled, while recycling waste and water where possible brings real benefits. Reed beds, for example, have been shown to be able to treat de-icer run-off in a natural way. Heathrow has a series of pilot beds, while the airport at Wilmington, Ohio and Ontario’s Pearson Airport both have full scale systems – with funding having recently been secured to allow Buffalo Niagara International Airport to join the growing club. By the first of January 2008 paper tickets will be a thing of the past with all of the world’s leading airlines and moves are afoot to scrap conventional boarding passes too, thus reducing a huge amount of unnecessary waste. The airport of the future will reflect the environmental concerns of the day. Heathrow’s proposed new terminal – Heathrow East – is an excellent example of this thinking in action. Intended simply to replace the existing Terminals 1 and 2 with a brand new, eco-friendly building, it will neither increase the number of flights nor increase capacity. A variety of methods are being considered to keep carbon dioxide emissions to a minimum, including using renewable energy sources, low energy systems and reduced artificial lighting. Heat generated within the building could be used to drive the ventilation, possibly as part of an integrated strategy for combined cooling, heating and power (CCHP). Water consumption – a major headache in the recent droughts for London and the south-east – will be minimised, with initiatives such as rooftop collection or an independent borehole to reduce demand on the mains supply. The approach to waste will likewise be environmentally driven, involving both attempts at waste reduction to minimise the problem in the first place coupled with a major on-site recycling scheme. With air travel growing swiftly, the potential for increased environmental harm is clear and though the focus of concern has tended to fall on extra flights leading to more carbon emissions, more passengers also need additional services to accommodate them. Often this means airport expansions, new runways, escalating vehicle movements and larger car parks, not to mention significantly greater demands being placed on water, sewage treatment and waste services. Fortunately airport authorities seem well aware of the need to achieve “green” growth and as the plans for Heathrow show, they are more than ready to step up to the challenge.